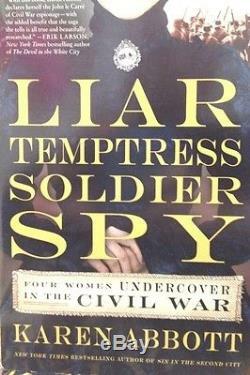 Liar, Temptress, Soldier, Spy: Four Women Undercover in the Civil War by Karen Abbott. 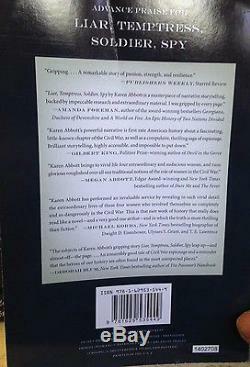 This is a new paperback Book Club edition. Sin in the Second City. And pioneer of sizzle history. , tells the spellbinding true story of four women who risked everything to become spies during the Civil War. Karen Abbott illuminates one of the most fascinating yet little known aspects of the Civil War: the stories of four courageous womena socialite, a farmgirl, an abolitionist, and a widowwho were spies. After shooting a Union soldier in her front hall with a pocket pistol, Belle Boyd became a courier and spy for the Confederate army, using her charms to seduce men on both sides. Emma Edmonds cut off her hair and assumed the identity of a man to enlist as a Union private, witnessing the bloodiest battles of the Civil War. The beautiful widow, Rose ONeale Greenhow, engaged in affairs with powerful Northern politicians to gather intelligence for the Confederacy, and used her young daughter to send information to Southern generals. Elizabeth Van Lew, a wealthy Richmond abolitionist, hid behind her proper Southern manners as she orchestrated a far-reaching espionage ring, right under the noses of suspicious rebel detectives. Using a wealth of primary source material and interviews with the spies descendants, Abbott seamlessly weaves the adventures of these four heroines throughout the tumultuous years of the war. With a cast of real-life characters including Walt Whitman, Nathaniel Hawthorne, General Stonewall Jackson, detective Allan Pinkerton, Abraham and Mary Todd Lincoln, and Emperor Napoleon III. Draws you into the war as these daring women lived it. Contains 39 black & photos and 3 maps. 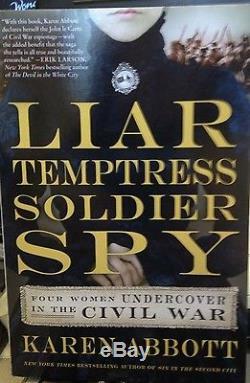 The item "Liar, Temptress, Soldier, Spy Four Women Undercover in the Civil War by Abbott" is in sale since Saturday, June 06, 2015. This item is in the category "Books\Fiction & Literature". The seller is "lawbkstore" and is located in Anaheim, California. This item can be shipped to United States, to Canada, to United Kingdom, DK, RO, SK, BG, CZ, FI, HU, LV, LT, MT, EE, to Australia, GR, PT, CY, SI, to Japan, to China, SE, KR, ID, to Taiwan, ZA, TH, to Belgium, to France, to Hong Kong, to Ireland, to Netherlands, PL, to Spain, to Italy, to Germany, to Austria, RU, IL, to Mexico, to New Zealand, PH, SG, to Switzerland, NO, SA, UA, AE, QA, KW, BH, HR, MY, TR, BR, CL, CO, CR, DO, PA, TT, GT, SV, HN, JM.